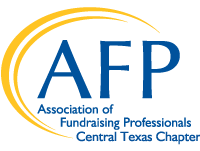 Welcome to the Association of Fundraising Professionals, Central Texas Chapter! The Central Texas chapter has served nonprofit fundraising professionals in our community for over 30 years. Our chapter currently serves nearly 50 members in the greater Waco, Temple and Killeen areas. Unless otherwise specified, all meetings are held at the Community Bank & Trust Wealth Management building at 1711 Lake Success Drive, Waco, Texas, 76710.